News & Stories > Blue Sky Science > How are video games used in research? 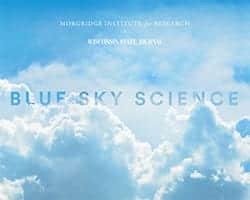 Blue Sky Science: How are video games used in research? How are video games used in research? Video games are used in about five different ways. First, they’re used as a form of behavioral change. Games can help you set goals and help you accomplish those goals by figuring out game mechanics that make those goals more fun, more compelling, and therefore make you more likely to meet your goals. The second way they’re used is for what you might consider cognitive change. A lot of the work we do here at GLS is focused on games for learning. We did a game with Dr. Jamie Thomson who runs the stem cell research lab over on UW-Madison campus. They were interested in: how can we increase public understanding of stem cell research? What we built was a game called Progenitor X. The cool thing about this game is, what is better than a stem cell game that includes zombies? You actually save the world by doing stem cell science. You save them from a zombie apocalypse. A third way they’re used now in cutting-edge science is thinking about games as a form of therapy. Games can be very effective for helping people retrain their own brain in how to self-regulate attention, how to decrease stress and other basic cognitive neuroscientific behaviors. A fourth way they’re used is pretty crazy and novel. They’re used as platforms for actual scientific discovery. Rather than just a group of two or four or ten or twelve solving a problem, you create a world in which you make that problem-solving fun. And you get thousands and thousands of people all working on the problem at once. It turns out you can have incredible scientific discovery that way. And the fifth way is one I don’t want to forget. Games are just a sticky medium for engaging people in artistic, beautiful worlds. Most of us like to think that science is one of them.